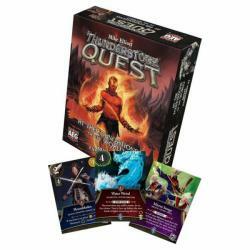 Alderac Entertainment Group will release Thunderstone Quest, the new iteration of the hit deckbuilding game designed by Mike Elliott, on November 8. Two expansions for the game are scheduled to follow. 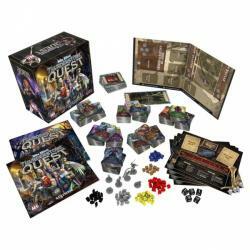 Thunderstone Quest has players assemble their party to explore the dungeon, fighting monsters and collecting treasure as they go. There are also side quests to complete and guilds to join. The games if for 2 � 4 players, ages 14 and up, and plays in 60 � 90 minutes. This version of the game was funded via Kickstarter this summer (see �'Thunderstone Quest' Comes to Trade�), in a campaign that raised $731,383 from 6,916 backers ($105.75 / backer average). Thunderstone Quest: At The Foundations of the World Expansion will be the first expansion to release. This chronicle adds cards to play the Adventures at the Foundations of the World Quest outlined in the base game Questbook, or just expand player options for random set ups. MSRP is $39.99. As an expansion, it requires the base game to play. 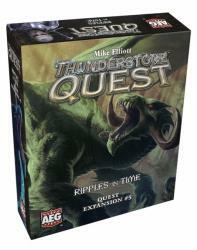 Thunderstone Quest: Ripples in Time expansion will bring some blasts from the past back for players of classic editions of Thunderstone. Magical tampering has disrupted the flow of time, and old cards from Thunderstone have reappeared. The Ripples in Time quest can be played on its own or combined with other cards for random set-ups. MSRP is $39.99. As an expansion, it requires the base game to play.